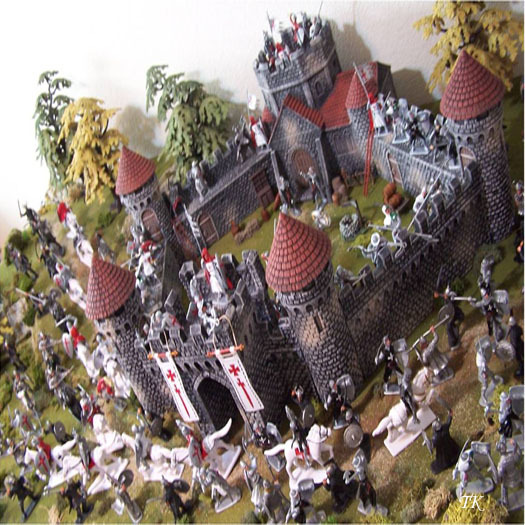 A toy castle provides the perfect play setting for plastic Knights, Crusaders, Vikings, and Sword & Sorcery heroes. The pages of King Arthur & the Knights of the Round Table come alive in a miniature world full of medieval chivalry and adventure. 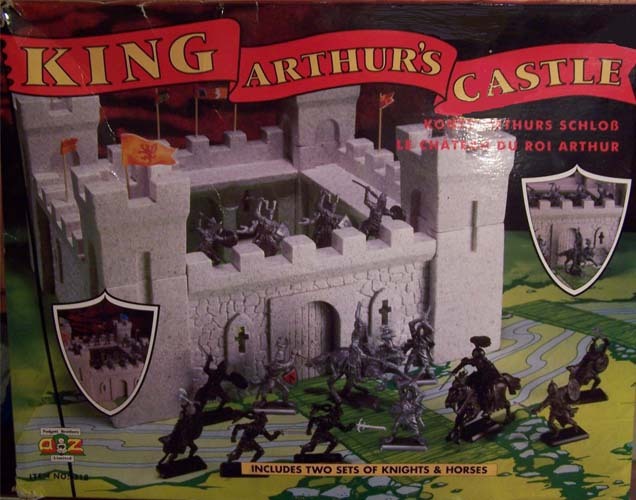 Along with toy knights and castles, detailed toy catapults, siege towers, trebuchets, wagons, ladders, and other accessories combined with rocks, shrubs, sand, and whatever else is handy make a diorama that no computer game could ever equal. 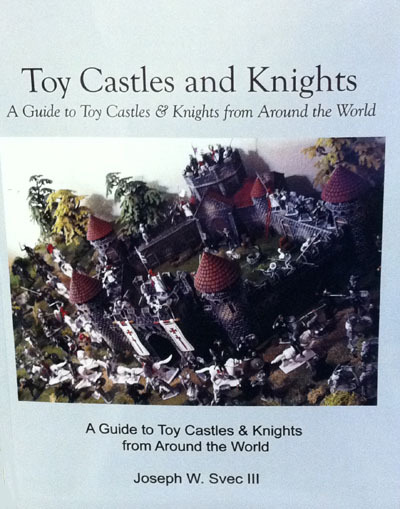 This guide book endeavors to bring you back to that magical time of youth, or if this is your first journey, to lead you on a tour of over 101 toy castles from the 1950's to 2011 and the multitude of toy knights that accompany them. Whether living the childhood dream of being a knight in shining armor, recreating the legends of King Arthur and Robin Hood, searching a dungeon for hidden treasure, or saving Middle Earth, toy castles and knights are the ultimate adventure. In planning our tour of medieval toy castles, we offer you this guide book as a map, so buckle on your sword, take hold of your shield, grab your dragon repellent, (We will meet plenty of dragons.) and let's review our road map. Our guide book is divided into twelve chapters, first by significant themes, then by country of origin, and finally miscellaneous categories. The first four chapters feature the main significant themes; King Arthur and Camelot Castles, Robin Hood Castles, Sword & Sorcery/Fantasy castles, and The Lord of the Rings. In the next eight chapters we will go on a world tour of toy castles made in Germany, France, England, Spain, Italy, Russia and China. Then crossing the ocean to America, we will begin with MARX Toys, the largest toy manufacturer of his time, and then look at toy castles from other American companies as well as Canadian and Mexican manufacturers. From there we will look at the miscellaneous categories examining the EXIN castle building system, semi-custom castles, and 90mm castles. Along the way we will see hundreds of toy knights, Crusaders, Vikings, and Fantasy figures from around the world as well. 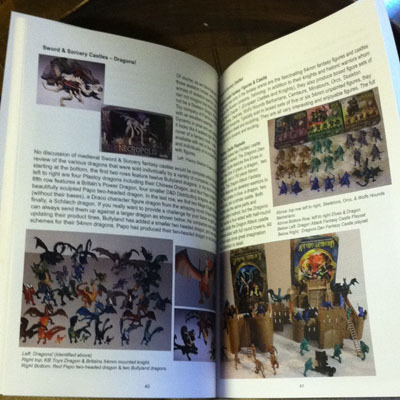 Over three years in the making, this guide book is a pleasant journey into the time before computers and video games into the miniature world of Toy Castles & Toy Knights, brought to life through your imagination.